Normal person who is drowned in the CG, 3D Animtion and Visual Effects World ..
I&amp;#039;v had my Bachellors degree in Graphic Design, and graduated the second in my class, but while i was on my way of my study, i found my self drowned in 3D Animtion and Visual Effects , it has been my dream and became my passion . So i decided to dig in this field and to improve it by searching the knowledge needed &amp;amp; required . 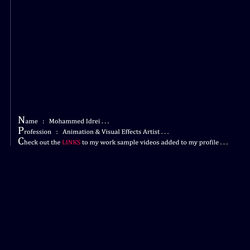 I&amp;#039;v reached at some point in that knowledge and started my first career with Animation and Visuall effects to convert this from a Self tought hobby to a work profession, and that helped me to have my 100% scholarship at SAE Instute to abtain the 3D ANIMATION CERTIFICATE .. I graduated from the &amp;quot;One Year Diploma&amp;quot; Program and took the First in my class in addition of winning the &amp;quot; 1st STUDENT OF THE YEAR AWARD &amp;quot; . That was a big Unforgettable step for me ..
After that &amp;quot;B4 Jordan&amp;quot; , a Production house and 3D Animation Co. was established by the same Group of SAE &amp;quot; Luminus Group&amp;quot;, they helped me take the opportunity and highered me in the right position . Its been 2 years now, iam the Lead Compositor &amp;amp; Visual Effects Supervisor in B4 Jordan . Many thanks to SAE for giving me the chance and raising me in a small time period . As the hobby side ..
I&amp;#039;m a musician, and i play the Electric Guitar . It started with a hobby and self tought too since 2002 , but now i&amp;#039;v had my &amp;quot;GRADE 8&amp;quot; guitar performance exam from TRINITY University of music in England (UK) with the highest grade and record in my country .